Want to test your fortune? Want to try it in a funny way? Come to Mega Fortune and surely it’s your place! 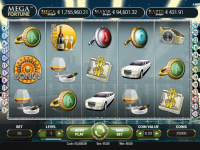 NetEnt didn’t want to lose to Microgaming gaming software and their “Mega Moolah” game, and so, it introduced its own super captivating and engaging slot game in the form of “Mega Fortune”. As expected, within no time, Mega Fortune became a big hit among players. Put simply, Mega Fortune is all about money and celebrates the luxury. The entire theme of the game is designed such that it gives you a feel of luxurious Las Vegas casinos and slot machines. The funky retro style music runs in the background which further adds to the feel and grandeur. Talking about the slot, Mega Fortune consists of 25 paylines and has 5 reels. It is a progressive slot game and comes equipped with a rich and luxurious theme, all thanks to the captivating graphics like diamond watches, credit card, and sports cars which impart a luxury look and feel to the game. Further, it is comparatively easier to play Mega fortune, and you can spin for as low as 25p and as high as £50.In this article, we will know more about Mega Fortune. We will focus more on the symbols used in the game, the pay outs, and the winning potential. We will additionally also see how to play the game and would help you make the most out of this entertaining slot. Let’s get started without beating around the bush further. The game significantly represents wealth and sophistication, and the reels are set against an expensive background with champagne, fast cards, and yachts. The game consists of lower value symbols in the form of J, Q, K and A which are engraves into the colored rings. Talking about the higher value symbols, they are represented by a money clip, brandy and cigar combo, an expensive watch and a limousine. You need to keep a close eye on the symbols to make sure that you make the most use out of them. As discussed, there is a champagne scatter symbol which can change the route of the game within minutes. If you manage to spin a few of the scatter champagne symbols, chances are high that you would not only end up winning but would also be able to launch a bonus free-spin game. Thus, to conclude, this symbol can help you win the jackpot, and you should have a close eye on it. Additionally, luxury yacht symbol is also pretty powerful and can help you take place of other standard symbols present in the game. Again, keep your eyes on this symbol, and if you are able to get a winning line with this symbol, you are sure to get a double payout! What’s more? This yacht symbol can also help you win 10,000 coins which you already know how big an amount is. All you need to do is get 5 yachts in a line and you are all sorted. As we just discussed, the biggest possible win in the Mega Fortune is getting 10,000 coins which you can earn by getting 5 yachts in a single line. This is the biggest payout, and the other payouts can be seen on the game screen and are pretty straight forward. Who doesn’t love champagne? We all do, and there is one more reason why you should love champagne if you do not already. This is because Mega Fortune allows you to enter free spin bonus round once you get 3 champagne bottles! Once you enter the bonus round, you need to choose 1 out of the 3 icons. Once chosen, this will reveal the number of spins you are entitled to get in the free spin round along with the bonus multiplier. The maximum spins one could get in a free spin round is 10 spins, with a 5x multiplier. However, the story is not finished yet! You still have a chance to win more free spins by spotting 2 or more extra bottles. Thus, keep finding the champagne bottles, and keep the ball rolling. You can also enter the Mega Fortune Bonus. You can activate this by getting 3 bonus symbols or more on the reels from left to right. Once you have them, you will be eligible to have a bonus wheel. Simply, click on it, and spin it, and see what is in for you. There are three levels of rewards you might find. The first level reward gives you an instant payout which is amazing. However, the second level gets better and gives you a free access to the rapid progressive jackpot. The third level is even luckier and this is where the real magic begins. You get a chance to win Lamborghini and Ferrari. As we said, it is going to get better in the third level, so it has! Believe us, it is fairly easy to play Mega Fortune, and the payouts and winning amounts are higher too, and definitely worth all the efforts. This is simple and straightforward game. If you have always loved progressive slots, this slot would be easier to make a switch to. All you need to do is place a bet on any of the lines between 1 and 25. Next, you need to choose the coin value and decide how many coins you are you willing to play. Then, simply hit the spin button and you are done. You can choose to play with a maximum of 1000 coins per spin. If you want to play with the same number of coins each time, you can simply make use of autoplay button which will use the same number of coins every time. When not required, you can cancel it anytime and take the manual control back. Further, you can choose to adjust the game settings as per your needs, and have full control over the theme, music and sound effects of the game. Thus, get all set to have the best slot gaming experience. Powered by NetEnt, you can totally rely on the quality offered. Combined with great graphics and equally jazzing music, there is not even a moment when you will feel dull and boring during the game. Further, bigger payouts and progressive jackpot notch up the excitement. Rest assured, the payout is good, and this can be concluded well with the fact that there had been various big wins in the recent past. One such win happened in 2012 when a Finnish player took €6.9 million to his home. This is not it. It was in 2010 that a Norwegian student was successful in winning a big hand of €11.7 million. But, what made the history was a whopping €17.8 million win in January 2013. Thus, it is not wrong to conclude that Mega Fortune is one of the best slot games you would ever like to try your hands on. Wait no more and get started, straightaway!